The days of high cable/satellite bills are gone. Bundles and contracts are a thing of the past. No more waiting on hold for hours trying to get a better deal. Cord-cutting is real. Now you can have access to the programming you want, when you want it and even *where* you want it–that’s right, you can take it with you wherever you go! 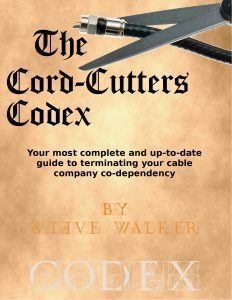 Our special report The Cord-Cutters Codex will tell you everything you need to know to make cord-cutting quick and easy. By following our guide, you’ll avoid the costly mistakes that many make when setting sail on the cord-cutting journey’s uncharted waters.